Saturday, March 26, 1859.Lincoln, IL. Lincoln writes to William A. Ross, of Washington, Illinois, in response to Ross's proposal to publish a book of the debates between Lincoln and Stephen A. Douglas. Lincoln expresses a keen interest in the project and recommends a layout and a title, "Illinois political canvass of 1858." Lincoln suggests that Ross "include the correspondence between Judge Douglas and myself which led to the joint discussions." 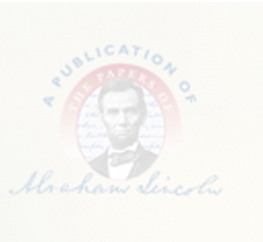 In the interest of fairness, Lincoln proposes using debate reprints from two different Chicago newspapers, one favorable to Douglas, and the other favorable to Lincoln. William A. Ross to Abraham Lincoln, 18 March 1859, Robert Todd Lincoln Collection of Abraham Lincoln Papers, Library of Congress, Washington, DC; Abraham Lincoln to William A. Ross, 26 March 1859, CW, 3:372-74. In court Lincoln files power of attorney from defendants and confesses judgment against them in Blong v. W. C. Taylor & Co. for $8,428.77, amount of note sued on and interest. Photocopy.